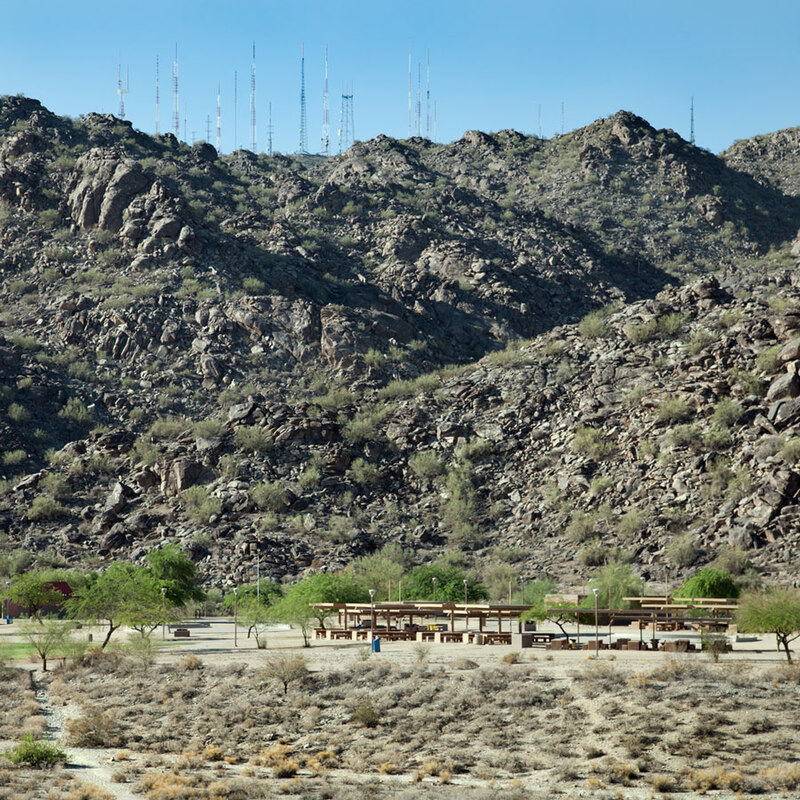 Urban Wilderness: Phoenix: it’s a desert out here! Although I feel as though I have escaped the city for a moment, I am in fact still in Phoenix when attacked by a baby bird no longer than my finger. I was sauntering down a rock-strewn slope towards South Mountain Park. A larger bird that I took to be its mother darted out from under the low bush where they both had been hiding. Her attempt to draw me away from the nest would’ve succeeded had she also taught the fledgling to hold still. 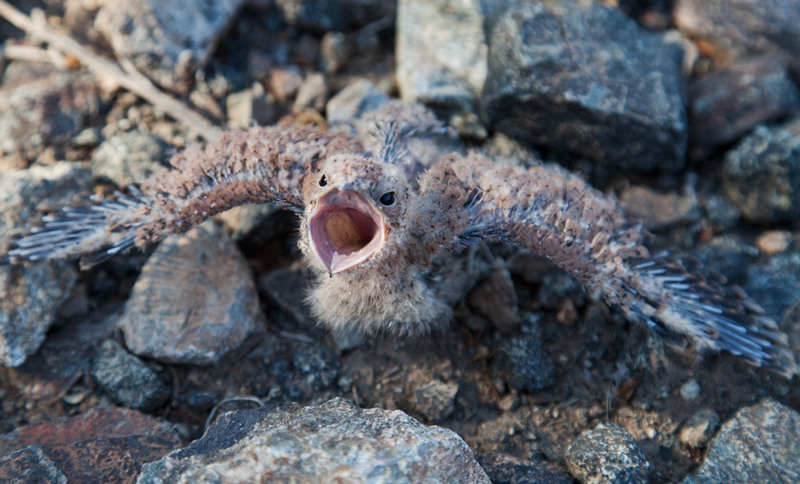 But, squawking a tiny cry, it bolted in another direction. Lucky for them I am not a coyote. The desert is an uncompromising place. My eye follows the mother bird, as intended, but I glimpse the fledgling with peripheral vision. When I look back, I discover an apparently lifeless body, one wing outstretched, motionless, as it should have remained from the start. Its ruddy coloration and coarse texture resemble exactly the stones all around my feet. A marvel of adaptive camouflage. I might have stepped on it completely unaware of its all too fragile existence. I approach, ever so cautiously. Without warning I cross an unseen border, the limit of little creature’s restraint. It leaps up. But instead of running away, it raises its partially fledged wings and lunges towards me, mouth agape, squealing furiously. When I don’t retreat, it lunges again, repeatedly, as mightily as its miniscule presence can muster. If a fearsome giant approached me, would I have that kind of courage? Would I recognize the limits of my restraint? South Mountain Park is either “touted as” or “reputed to be” the largest city park in either the country or the world, depending on which of two trail guide books I refer to. Whichever it is, at over 16,000 acres this one park alone is larger than the entire Milwaukee County Parks system. I look across a shallow valley towards the park. Just below, across the highway, is “Ponderosa Stables” where you can hire a guide and take trail rides. Beyond that I can see a flat space with picnic shelters. The backdrop for the scene is the closest of no fewer than three mountain ranges within this single urban park. Transmission towers line the ridge top like an upright comb with missing teeth. In a park this size, I guess, one must expect a gradual transition from urban to wilderness. 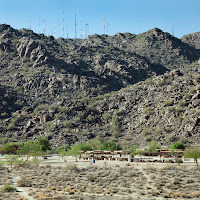 I came by bus from downtown Phoenix to hike in the wilderness. The guidebooks map out any number of trails inside the park, but no one, it seems, is expected to walk to the park. The bus line terminates about a half mile short of the last subdivision and it is there that the sidewalk ends. I am left to fend for myself on the narrow highway shoulder, to cut through Ponderosa and traverse a shallow arroyo. Although early morning, it is already hot. 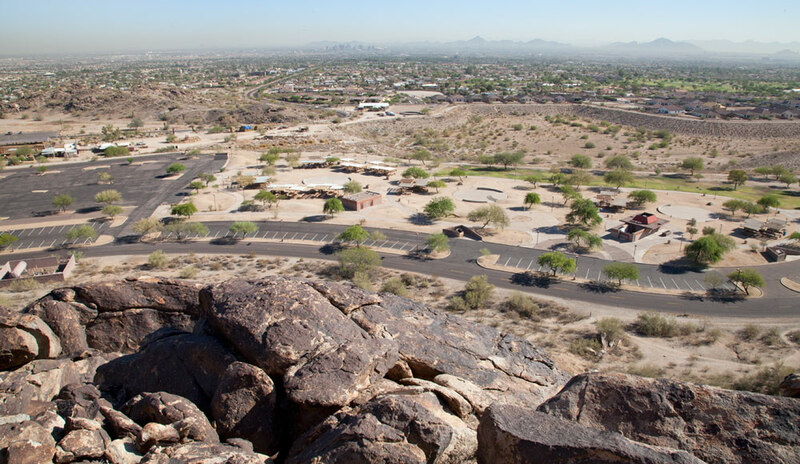 Yesterday afternoon, I was told, the thermometer reached 117° - a “personal best!” An estimated three million people visit South Mountain Park annually. Clearly they choose a more hospitable time of year for it. The desert can be an uncompromising place. 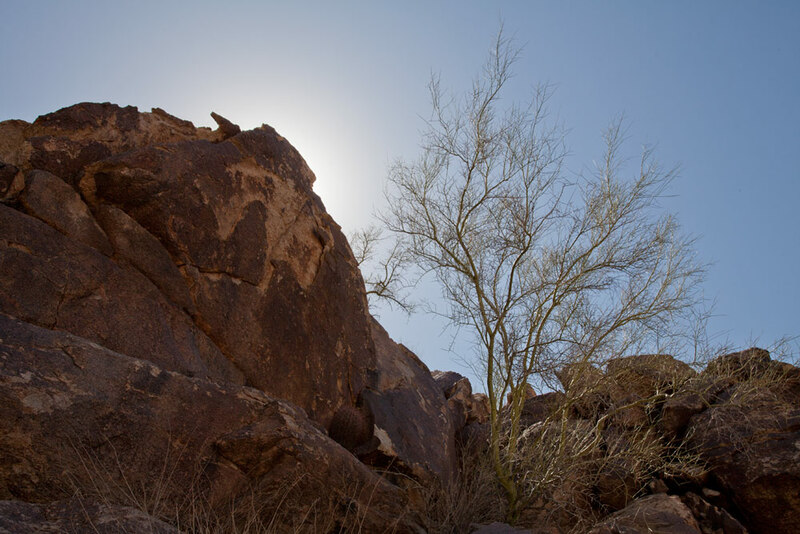 The Akimel O'odham, or “river people,” were living in the Phoenix valley along the Salt and Gila rivers long before the recording of history. In their creation story the first person, Juh-wert-a-Mah-kai, or “The Doctor of the Earth,” created the Earth out of sweat he rubbed from his breast. How fitting for a desert people to revere the life-giving moisture of their own bodies! As the sun rises towards a punishing zenith, I feel the sweat pouring from my own breast. 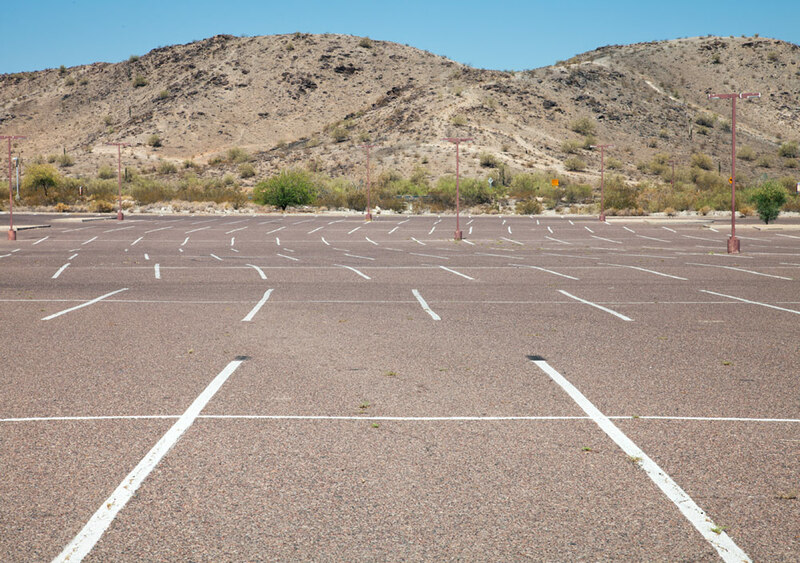 What kind of world will we create in our air-conditioned glass towers, riding in air-conditioned cars along on the ribbons of concrete that thread through Phoenix today? Signage under a conveniently sited park ramada explains that the Hohokam Indians, ancestors to the O’odham, created these petroglyphs 1,000 to 1,500 years ago. 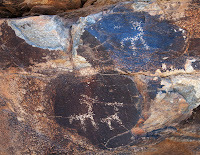 It goes on to speculate, “The connection of this artwork to Hohokam life is unclear, but may have a relationship to the spiritual beliefs of these indigenous people.” Our dominant cultural paradigm being scientific, we seem to be comforted by explanations and theories. Why can’t we be satisfied to see this as pure creative impulse, a response to intensely felt relationships with the natural world? Is it because those relationships have been broken, air-conditioned? 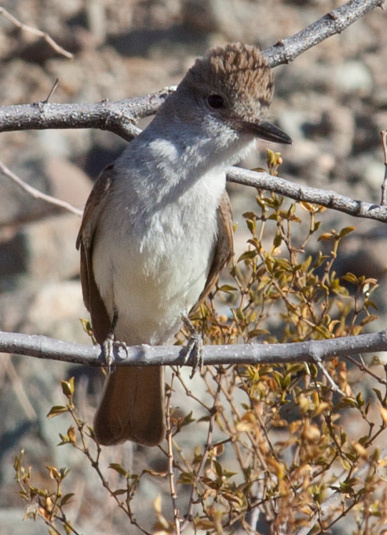 My encounter with the unidentified samurai fledgling is repeated with a somewhat less aggressive infant Ash-throated Flycatcher. Both parents flit from tree to tree, chirping excitedly to draw me towards them. A bird on the ground is at a distinct disadvantage. It is no wonder that ground nesting birds on islands like Hawai’i that never before experienced native predators have suffered disproportionately when non-native animals, like pigs and rats, were introduced. I give this little bird a wider berth so that the whole avian family can breathe easier again. 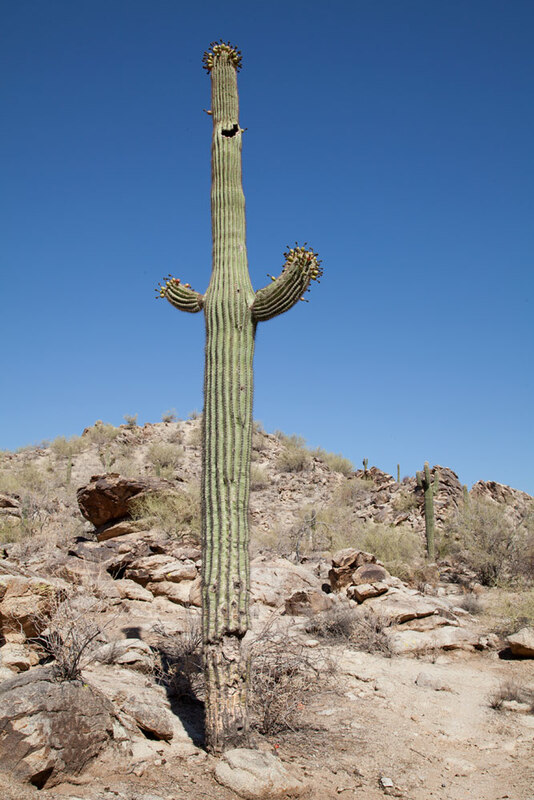 The saguaro stands rigidly erect, like a comical stick figure with asymmetrical arms upraised as if in greeting. It’s lopsided “smile,” curiously congruent with one of its arms, no doubt is a haven for some other family of birds that lives high above ground. 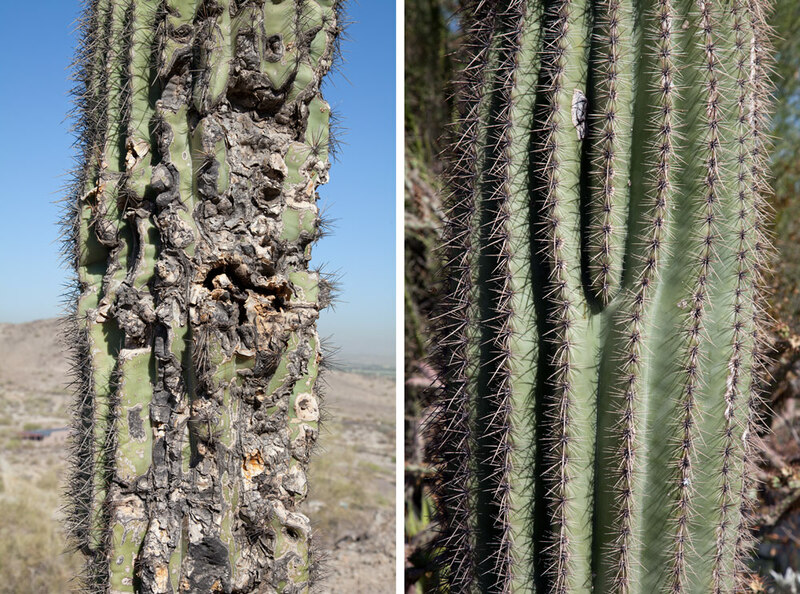 Native species of woodpeckers, finches, martins, and flickers commonly excavate cavities deep enough to hide their young from view of predators – and humans that aren’t so giant next to a mature saguaro. Yesterday, at the Desert Botanical Gardens, I saw clusters of plump, unblemished saguaro and other cacti. Here in the “real” desert I see quite a few saguaros, although much more widely dispersed. None is plump or unscarred. Most are completely or partially girdled. It’s a wonder that any of them survive to reach great heights. What good are the spines on a cactus if they don’t keep a rabbit from chewing on it? From the slopes of the mountain the towers of downtown Phoenix are distant and small. The rest of the city is vast, flat, and gray with haze. And yet, this too is Phoenix: a mountain range that rises out of the plain of the city like an island. A sea of subdivisions laps at its shoreline, but it is wild enough to be a danger to the careless. It is the kind of place to which I am habitually drawn. I humbly claim kinship to Thoreau, who said, “I love to see anything that implies a simpler mode of life and a greater nearness to the earth.” And yet, I am uneasy. Perhaps it is the heat. Despite the marked trail, the boot prints in the dust, and the occasional, alien sound of tire treads on pavement out of sight below, I feel extraordinarily solitary; not simply alone but out of place, non-native, like a pig or a rat. Sweat pours down. I want to create a new world, but I don’t know how. The desert is an unforgiving place. It is also a place of remarkable adaptation. 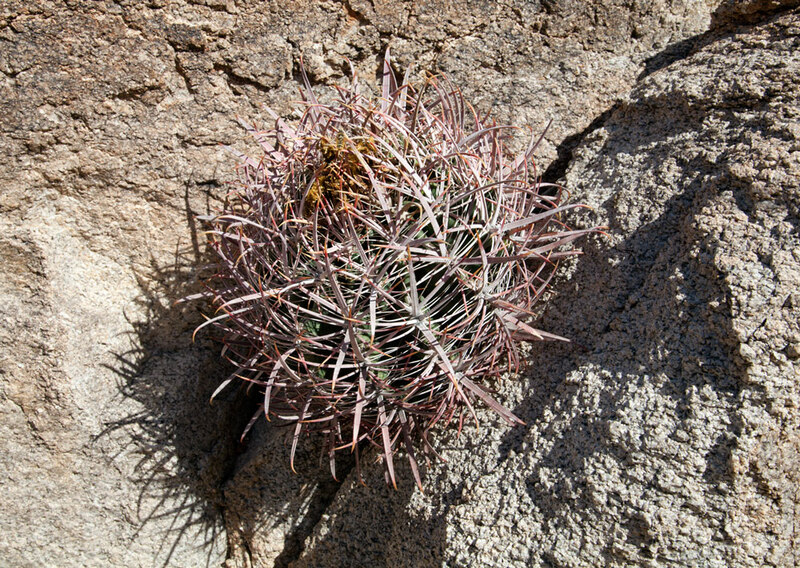 A small round cactus grows straight out of a rock. How is this possible? Water: in the desert it’s a matter of life and death. When it rains cacti swell and bloom; flash floods ravage arroyos. 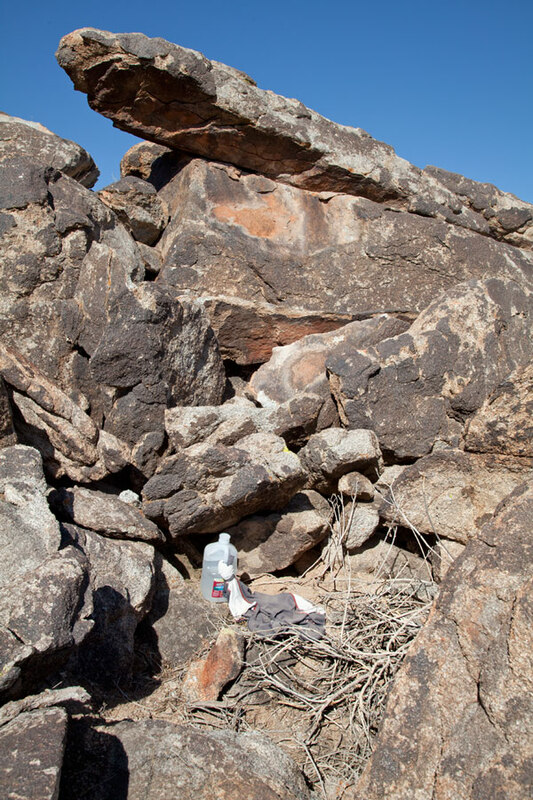 I find a cache of discarded empty plastic bottles in backcountry brush. Plastics don’t biodegrade like most materials, but some plastics will decompose in sunlight. Which sounds like a good solution to the casual indifference of this litter, considering the intensity of sunlight, until you learn that it decomposes into toxic component chemicals. In a crevice unshaded from the relentless sun I find a half-gallon bottle, still three quarters full of water. A ragged shirt is tied to its handle like a flag of truce. It speaks of desperation and begs a story. The surrounding rocks are mute. Phoenix is not on the border, which makes it unlikely that I have stumbled upon the tragic remnants of a migrant’s effort to cross over from Mexico. It is a sobering omen nevertheless. Some borders must be crossed; some we never even see. How do we know the limits of our restraint? It is still mid-morning but the blistering heat is taking its toll. My enthusiasm dulled, walking on the barren earth over sharp, penetrating rocks has begun to feel perilous. How can migrants possibly survive conditions like this day after day without food or fresh water? 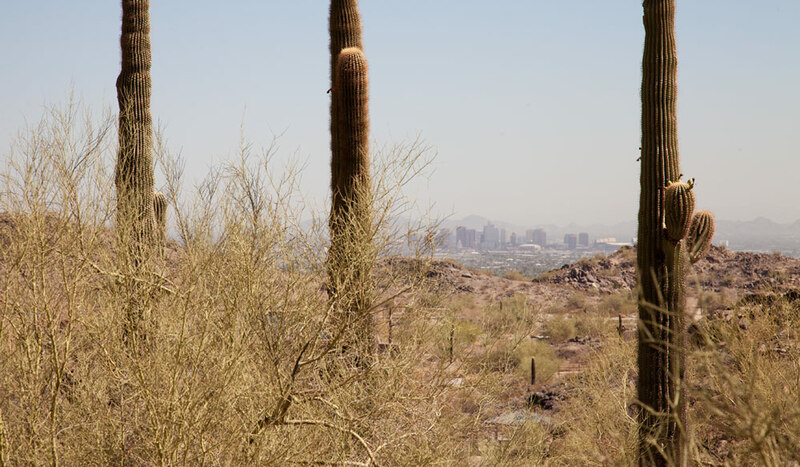 They must be akin to the saguaro, resilient, tenacious. Sometimes their fate is a solitary death. Which is the more uncompromising, I wonder, the desert or our immigration policies? 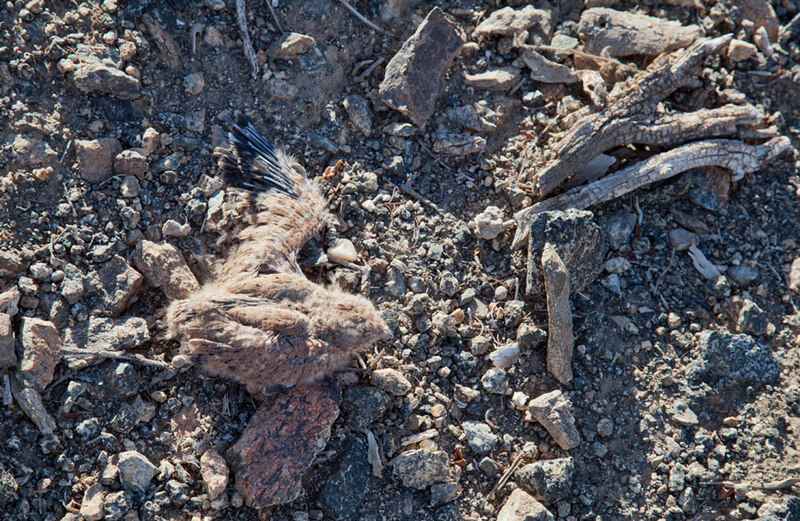 O’odham tradition says that the first creatures made by “The Doctor of the Earth” were the ants and the buzzard. I drink water and seek shade. I find the shelter of a large rock outcrop and slip into it like a pool of water. The refreshingly cool breeze that washes over me comes as a surprise. I’d gotten used to downtown Phoenix where it is hot even in the shade and the wind is like that from an open furnace. Cities are islands, too – of trapped heat. I sit bathed in silence. I hear no cars, no planes, no voices. It is the kind of pure, natural silence during which the occasional chirrup of an unseen bird is like a drop of water in the desert. A gunshot breaks my reverie, far off, over the ridge towards the Ponderosa. Then another and then a whole fusillade before it trails off again into silence. Later, as I find myself drifting into a blissful peace I hear the faint beep of my cell phone indicating a dying battery. Another intimation, not of death perhaps, but of the distance traveled, the disconnection from “the state into whose territories I seem to retreat.” I feel my allegiances taking a tighter grip. After a while I hear, very soft and high, coming over the knife-edge of the ridge, the sound of the breeze. It takes some time to calm myself, to settle myself, to ignore the ringing in my ears, and to hear the mountain breathing. I decide finally that this is why I’ve made the effort; why I took the long bus ride, why I walked the distance in the heat and the dust. In the end, this is why I came to Phoenix: to sit in the shadow of the mountain and listen to the wind. Back to Phoenix, though in truth I’ve never left. This is part 2 of a two-part installment from my Phoenix experience. To read part 1, click here: Phoenix Botanical Garden: Art vs. Nature. On Arts Without Borders I also wrote about the Phoenix Art Museum: cool in the heat. To read about why I went to Phoenix in the heat of summer read: The wilderness of immigration detention.